For that definition, it was probably an electronics learning kit I got for Christmas at about age 8 or 9. As I recall, it didn't teach electronics formulas or resistor codes, but was full of projects to hook up input devices like switches and output devices like buzzers and lights. It was like learning how to connect all the devices to your hi-fi, or connecting all your peripherals to a computer. It also gave me a good start toward understanding logic rules, like both switches have to be on for the light to shine, or if switch A is on, then switch B selects which light is on. I call this one the most meaningful, because, pretty clearly to me, it preceded my other important gadgets and inspired me to like gadgets and to understand how to build some. It's like how the transistor led to the chip, which led to microprocessors, which led to personal computers. Everything goes back to the first invention, in that sense. This electronics kit gave me the understanding that made it easy to progress to large logic devices with multi-pole switches, and some relays, which then progressed to a large tic-tac-toe computer with transistors which progressed to a large adding/subtracting machine with transistors, etc. The word 'meaningful' has the root 'meaning' which implies some emotion. In that sense, my first transistor radio, at about age 10, would fit the bill. It gave me portable music that I could listen to all night long as I slept, every night. 20 years later came the walkman, and 20 more years later came the iPod, but the real change in life, the one having the most 'meaning', was with the transistor radio. I always wanted my own computer. With the Apple I, I now had a machine that I could program. I would never run out of things to do in my entire life. So it's a close runner up to the other two. The gadget that has been the most attractive of attention ever is not my Segway. It's my nixie tube watch from CathodeCorner. It looks very large to other people and looks very strange. It's handmade in America too. The nixie tubes run on 140 volts on your wrist. Airport security guards who have seen every kind of watch ever made have a thrilling time with this watch. I used to fly to Japan regularly to scour new gadgets, and always bought tons of things which were always surprising at the time, but looking back, few have special meaning. The first consumer digital camera, I think the Mavica technology, was meaningful. The first one for computers, not TV's, was the QuickTake from Apple. But in many ways, no digital camera to this day has been as good as the first Ricoh one. 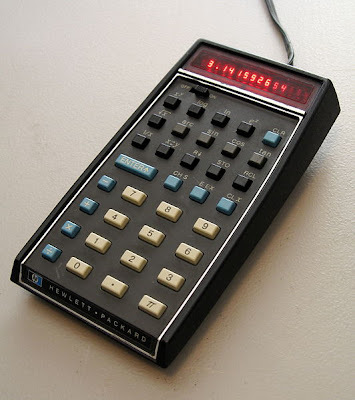 The HP-35 calculator was also very meaningful in my life, as it led me to an incredible job designing for the follow-on models. Much thanks to Woz for helping to kick off our series. Coming up soon: Phil Torrone, gadget maker and modder extraordinare.